Back in the bygone era before playstations and XYZ boxes, the comic video game that nuked them all was Konami's 6 player X-Men. 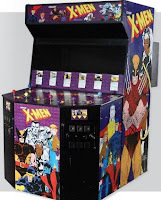 Back then, Saturday mornings racing down to the arcade to meet Storm and have her take all my disposable income, as I threw her up against the White Queen, Magneto and Juggernaut, was a steady relationship. And while friends or cousins might jump into the role of Wolverine or Cyclops (despite my in-game sales pitches that Colossus or Nightcrawler would be more help) I knew as long as I had Storm things would be fine. Then one day she was gone. A new car racing game was in its place (for whoever plays those) and having never reached the final x-stage in one innings, I became content with the fact our time was at a premature end. But today finds word Konami is bringing back the classic six player slug-fest, in online form. While I don't think I'll ever find anyone to play Dazzler, if after watching the below you feel like grabbing an X-Man (Colossus or Nightcrawler would help) and joining in on a great night out with Storm and I, just say the word. One of my favorite arcade games. This one, TMNT Turtles in Time (my brothers and I spent about 45 minutes trying to beat that one) and Street Fighter II Champion Edition. Wasn't a kid when I played that one though. TMNT - I forgot about that one. My Cousins and I used to play that too. I was always Mikey. Thanks for the flashback Craig! Just found this post; I also LOVED this arcade game when it came out! I loved the artwork on the arcade machine itself, the list of characters you could choose to play, and even the powers that all had which were very well represented. Hey Dale - glad there is another tie that binds in this Konami coin cruncher! You are right - the line-up was awesomeIf I ever took a break from Storm I always played as Colossus. I always said If I won the lotto there would be one of these in every room. That promise still holds true!